The Global Village team of 10 poses for a photo with the homeowner and his son and our host coordinator, Luis. Hola from Gracias, Lempira in Honduras! We have finally made it to the week we’ve been spending months to prepare for! Today was our Global Village team’s first day on the build site. 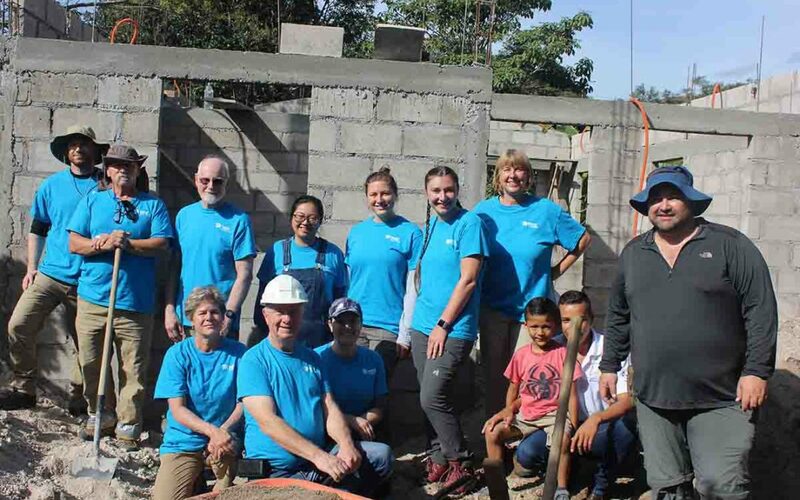 We met the home owner family that will be awarded the Habitat home, met various people from the Gracias, Lempira Habitat offices and got lots of work done! We began the work to prepare for placing the roof. We mixed concrete and carried bricks to help the masons, Russell and Daniel, build a support for the roof. The plan is to place the roof later this week. Our team has worked hard already and I can tell this build will be a success! Stay tuned for more on our Global Village build here in Honduras!